Smh, Malcolm. The belt is upside down. Act like you've been there before. While it's unclear which members of the Super Bowl champion Philadelphia Eagles will actually attend, the team's invite to the White House finally has a date, according to a local news station. 6ABC reports the Eagles have been invited to visit President Donald Trump on June 5. The team received their invitation back in April, but details were still murky. Trump's presidency has thrown a wrench into the tradition of championship teams visiting the White House, as many players who oppose his presidency have stated they wouldn't go; Trump rescinded an invitation to the NBA champion Golden State Warriors after the players and coach Steve Kerr indicated they weren't planning on going anyway. 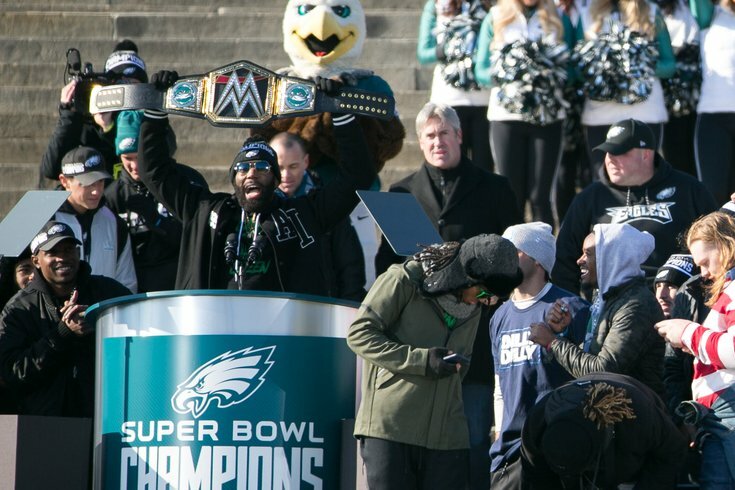 At least four members of the Eagles' title team — Chris Long, Torrey Smith, LeGarrette Blount and Malcolm Jenkins — have stated they won't attend. While the team has still reportedly worked with the White House to arrange a visit, owner Jeffrey Lurie is among the league's more liberal owners and his thoughts on the president are well known — he called Trump's presidency "disastrous" in a New York Times report published right around the same time it was announced the Eagles were arranging a visit. The Times report focused on the National Anthem protests in the NFL and how owners and players thought the league should handle the demonstrations, particularly after Trump publicly attacked players who participated. Lurie was supportive of Jenkins and Long when they demonstrated during the anthem last season.